This is a day late due to some very windy weather yesterday afternoon and early evening. It rained a bit Wednesday night but just enough to settle the dust and for the temperature to become cooler. In the morning it was a nice 12 degrees and overcast. We left Minyip after paying our $10 into the honesty box (very tempted to just move on! but I think it is great that communities like this and they are dotted all over this Yarrambiak shire to open up and provide these areas with toilets and showers ... just perfect for us. It costs $10 regardless if you use power or not ... hence the spot chosen last night was not great or ideal but right next to the power point! and headed in a north west direction. 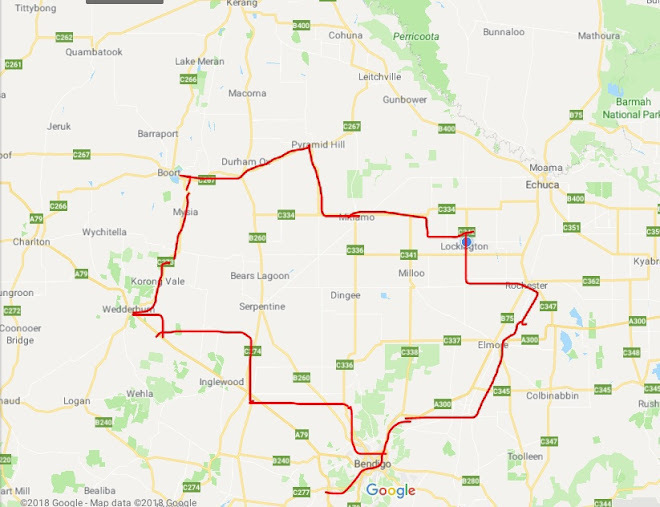 Now the day before we had a shocking northerly headwind and this morning the wind didn't really kick in until just before we got to Warracknabeal at about 10.30am. By then the temperature just dropped and it was very cold and the wind was blowing from the west at about the same speed as the day before. We picked up food from the IGA at Warracknabeal and it was chockers in there - it is closed Good Friday so everyone buys up big for easter! I restock on stuff and get food for 2 days. 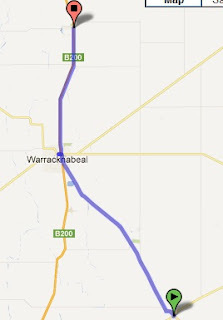 From Warracknabeal we join the highway and head north to Brim 20km up the road. We expected a bit more traffic on the road (everyone heading to their Easter destinations) but we were lucky and it wasn't that busy. We had a strong cross wind and everytime the road veered right to the east there was a little 'yipee' as it became a slight tailwind! there was no 'yipee' when the road veered left! We get to Brim and this town has a small dam/weir where they have toilets and showers and areas to camp - it is about 1km off the main highway so we camp there. It is a lovely spot and the facilities are great. Heaps of spots to camp both unpowered and 8 powered spots. About 5 vans already here so we picked one of the small spots next to the mushroom power point. I think everyone looks at us as to why we have power! We set up and the wind is really strong and we can't really do anything ... due to the mesh tent and alot of sand lying around it is getting in the tent so we lay down in the tent resting while the sand comes and and falls on and around us ... I feel like I am going to be buried in this sand in the tent. In the evening we go for a small walk and I am surprised as to how much water is in the weir. The campers and caravaners are very friendly and nice. Nearly all but one have a dog with them. This morning (good friday) we woke and it was cold to get out of the sleeping bags so we slept in until 8.45am. Here is our campsite. and there is still more in there! Today we are just relaxing the wind is still blowing from the west but now where near as strong as the previous 2 days. The forecast wind wise is looking very good for us - tomorrow we will go to Hopetoun to pick up food for Sunday and Monday and continue on to Lascelles. The wind will be cross and then slightly behind us.